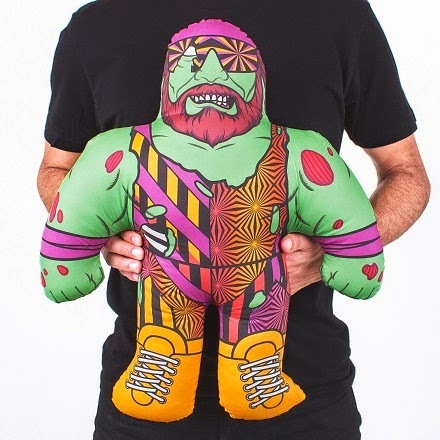 I've always thought that Tonka's Wrestling Buddies were the baddest stuffed "doll" a little guy could be seen totting around or napping with. They've made a comeback with Mattel's Brawlin' Buddies, but I have to admit the definition of their pecs look a little weird. Well Electric Zombie has topped them both (yes, even the originals) with these epic wrestling "Deadies." With a look that undeniably ties them to the brand, these guys take this years' entire wrestling collection's title "Legends Never Die" to Electric Zombie's level. The "Immortal Wrestling" and "Madness Wrestling Deadies" sold out immediately, but you can still grab one through a pre-order that ends Friday, 04.18.14, at noon EST. After that time, the "Madness Wrestling Deadie" will be gone forever! Each is reasonably priced at $60, as they are handmade in the U.S.A. and truly special. The "Mega Powers" set will get you both at the discounted price of $100. 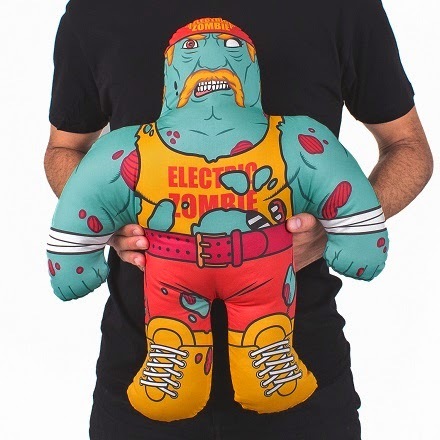 As I mentioned, both are part of the "Legends Never Die" collection, which continues to capture the best wrestling icons in only a way that Electric Zombie can. In addition to the toys, there are five new t shirts (I feel like Papa Shango needed little alteration) and two prints. If you're feeling the entire line, you'd be a fool if you didn't pull the trigger on the "Dead Match" box set, which includes everything except the toys for only $100. Check out this spectacular drop now in the Electric Zombie Merchline store.